This image was an assignment for the New York Times on the tea-growing culture and the tea drinking styles of Hangzhou, in eastern China. I’d spent most of the morning out in the fields photographing women harvesting the tea leaves on the sides of the mountains that surround the town, and later that evening I headed to this very strange little tea house. It was strange because the tea house was full of young men who look like they had just come out of the Shaolin Monastery (a famous training ground for kung fu in China). 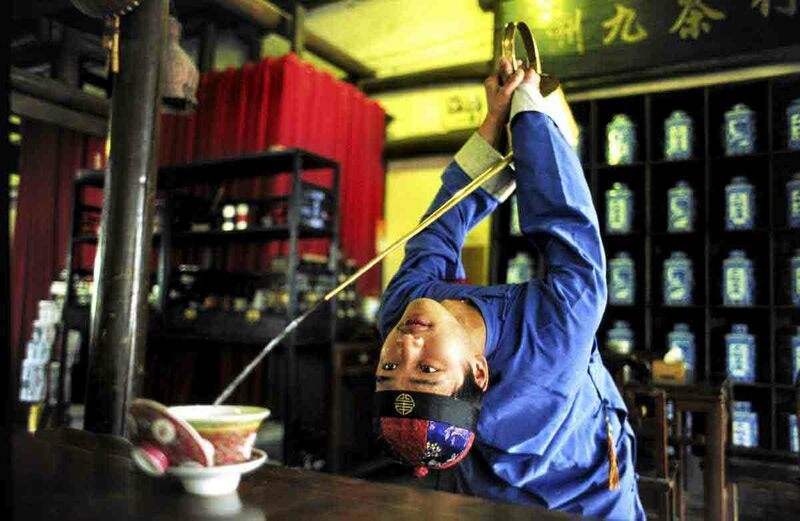 These young men were jumping and dancing around pouring tea in the most unique ways; a combination of tea pouring and martial arts. With their tea pots, with elongated spouts, they jumped and turned and twisted, pouring tea perfectly in to small cups. After watching for several minutes, it was my turn to have one of these men pour my tea. This young man approached my table and with air of arrogance he flipped himself upside down from about a metre away and poured my tea perfectly in to my cup without missing a drop. A magical moment captured on film. Ryan Pyle is a photographer, presenter, author and producer who’s based in Shanghai, China. He belongs to The WideAngle, a network of photographers who cover assignments around the world. For more images by The WideAngle photographers, please click here. Keen on photography? Don’t miss our top tips for shooting better portraits. Nice. I live in Guangzhou and have seen people serve tea in peculiar ways as well. The tea culture varies slightly from region to region.